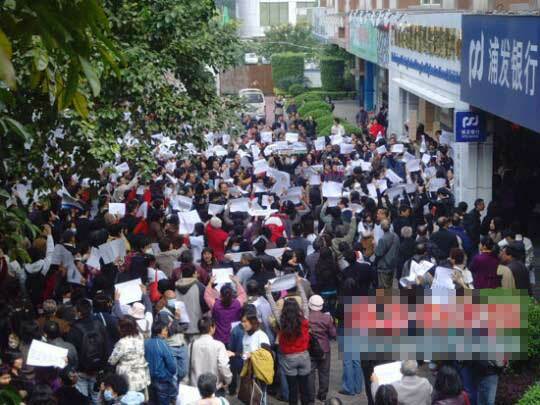 9:00am: More than 200 citizens have already gathered at the scene. 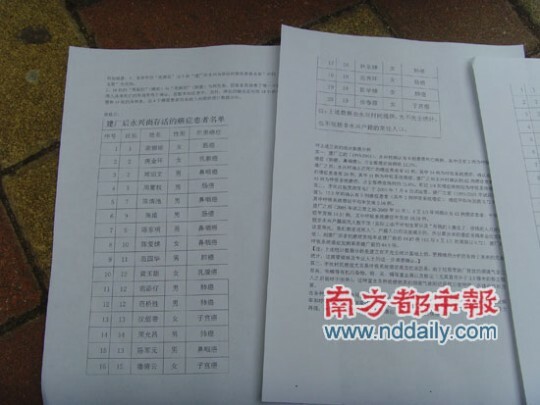 Some citizens are handing out leaflets which contain information on the carcinogenic effects of garbage incineration that they have gathered themselves. Some citizens who intend to file petitions are filling out the forms and getting instructions on how to fill. The reporter saw someone crouching on the ground while trying to write. 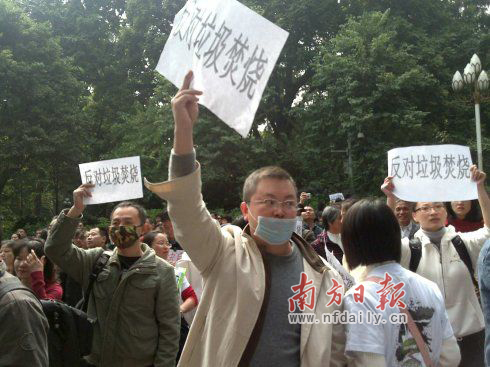 Several citizens raised placards that said: "We do not want to be represented." It is noteworthy that there are some citizens here who came to support the construction of the garbage-burning electricity generator stations. Our reporter found out that these are citizens who live near garbage landfills. 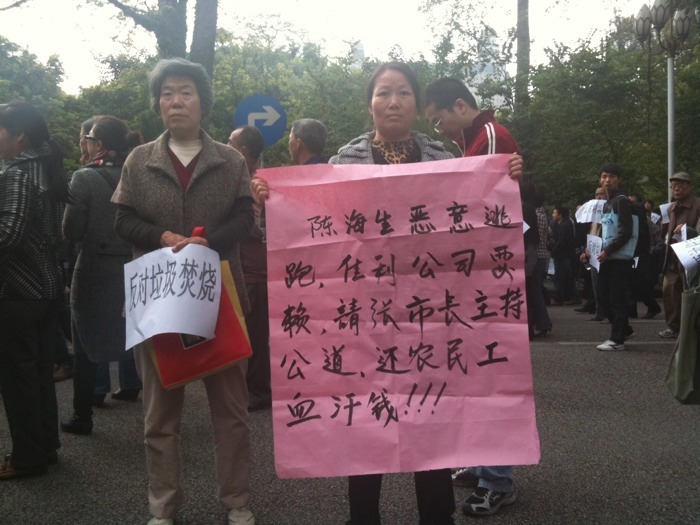 They have suffered from the pollution from garbage landfills and they want to see an alternative. 9:10am. 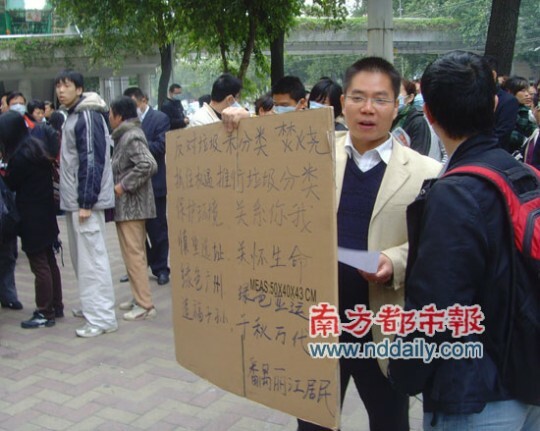 The reporter saw citizens raising placards to protest that the relevant departments are preventing them from hiring buses to come here to protest. The petitioning process is beginning. A woman called from the dais to tell people to proceed. 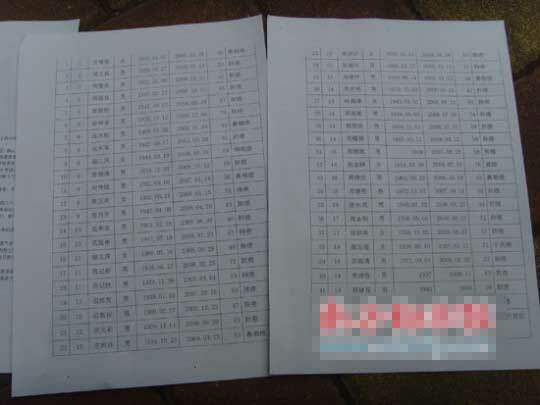 According to information, each petition sheet can have only five names. 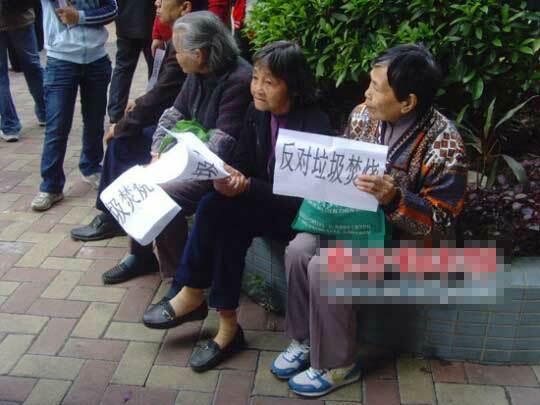 Some citizens were complaining because they could not get a hold of a petition sheet. 9:30am. 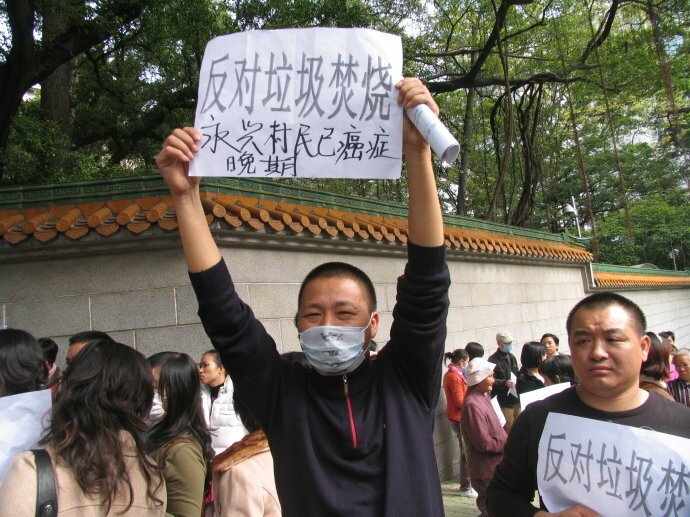 The reporter observed citizens chanting slogans: We oppose the construction of garbage incinerators; Protect the earth. More and more people joined in the chanting. The security guards are dispersed outside the crowd. The scene is still quite orderly. 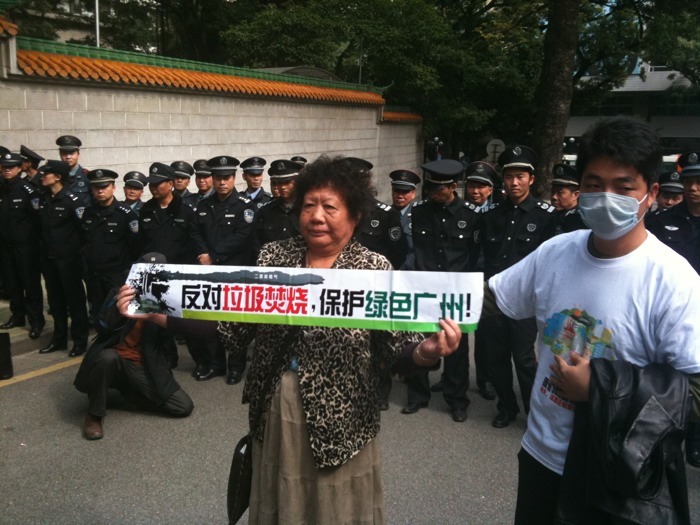 The police has set up a blue warning line to keep people inside the petition area. People are asked not to step past the warning line. 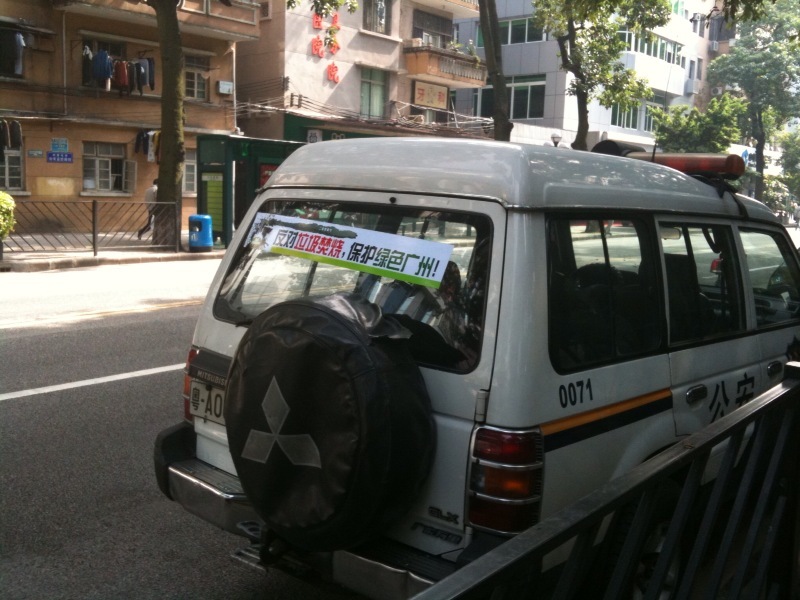 But under strong protest from the people, the warning line on the right has been removed by the police. 9:50am. The reporter observed citizens changing to new slogans: We oppose bureaucratism; Listen to the people's voices. More and more people are in the petition area. The plaza in front of the petition building is very crowded. People are forming a circle in front of the building and chanting slogans. 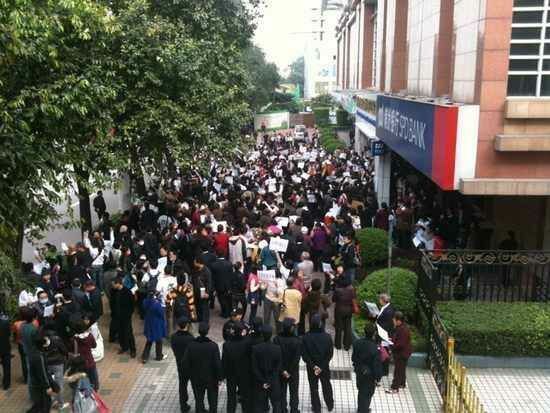 Because the citizens were orderly and kept within the designated zone, traffic on Jiefangbei Road has not been affected. Compared to the crowded scene outside the petition building, the lobby seemed relatively deserted. 10:00am. 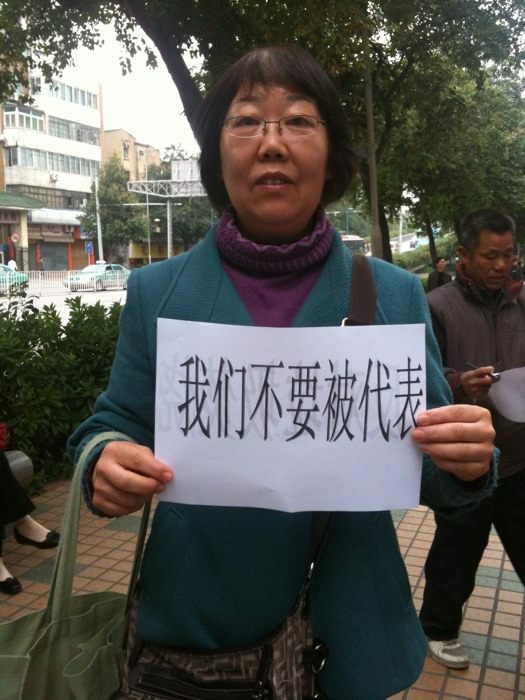 The citizens' slogan becomes: Respect public opinion. A photographer has just climbed up to a high point to take photos. The crowds turned towards him and chant loudly. 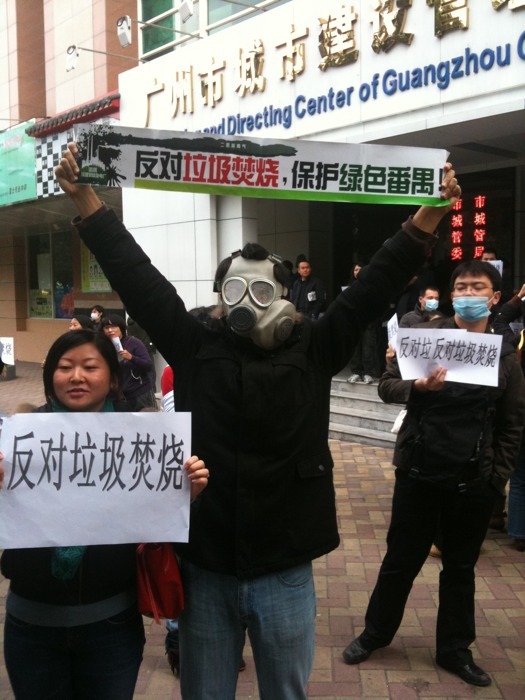 The reporter saw that the citizen with the gas mask has steam all over the goggles. 10:20am. 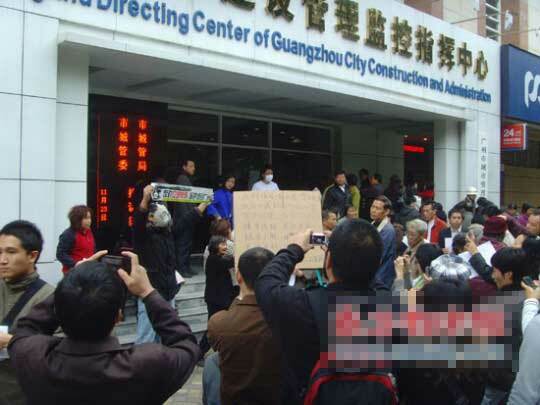 Some citizens call for people to go to the city government building to express their opinons. The crowd moved forward toward the city government building. 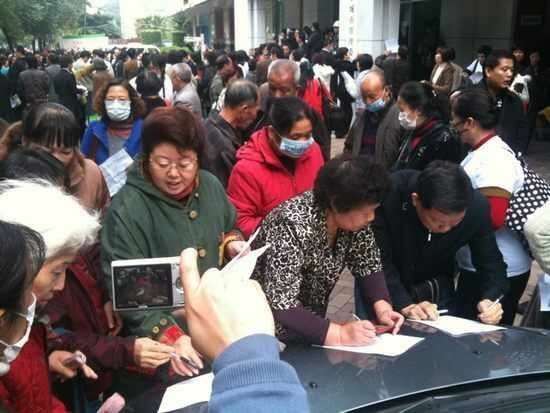 A citizen said that the petition process allows only three to five persons at a time. So they cannot wait any longer and they want to go directly to express their opinions to the city government. The citizens lined up and headed towards the city government building. The police officers and security guards responsible for maintaining order did not stop them. 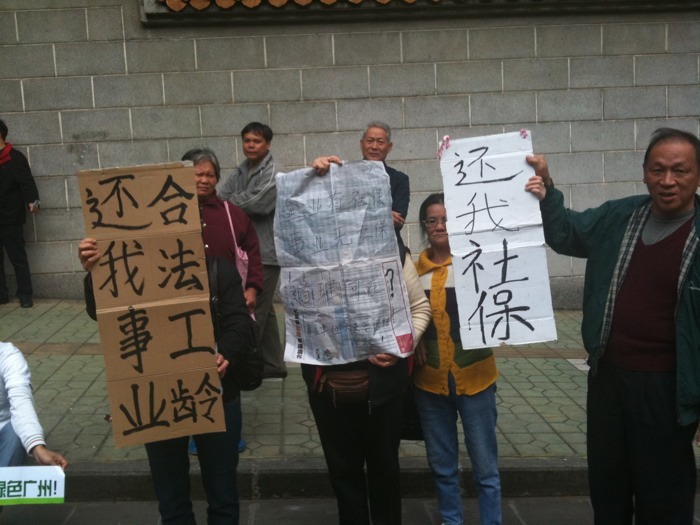 Many citizens are making photocopies of signs. The photocopy shop owner said that the copies will be for free. 10:30am. 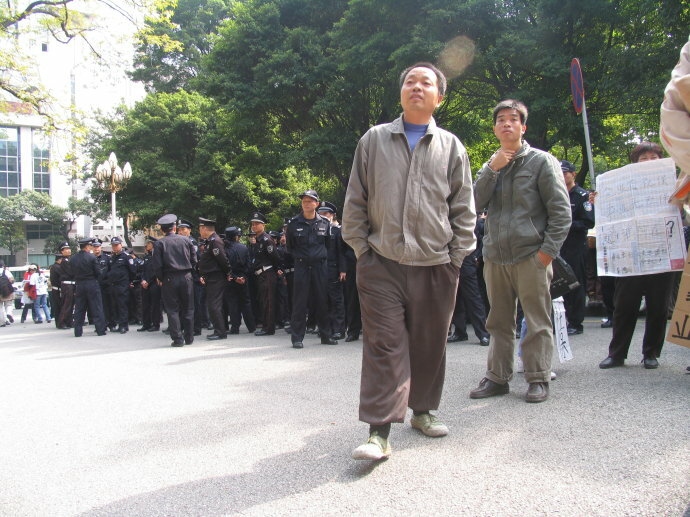 The reporter followed the crowd to the city government building. 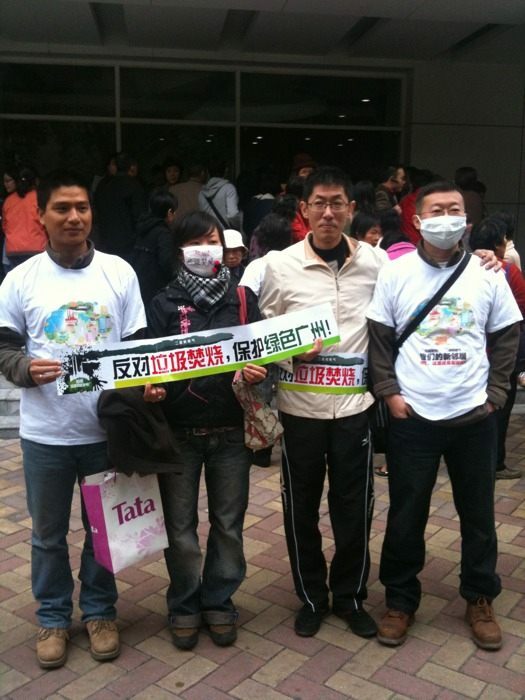 The place is already filled with slogan-chanting people: We oppose garbage incineration; protect our green Guangzhou. A warning line has been been quickly set up in front of the building entrance in order to maintain public order. 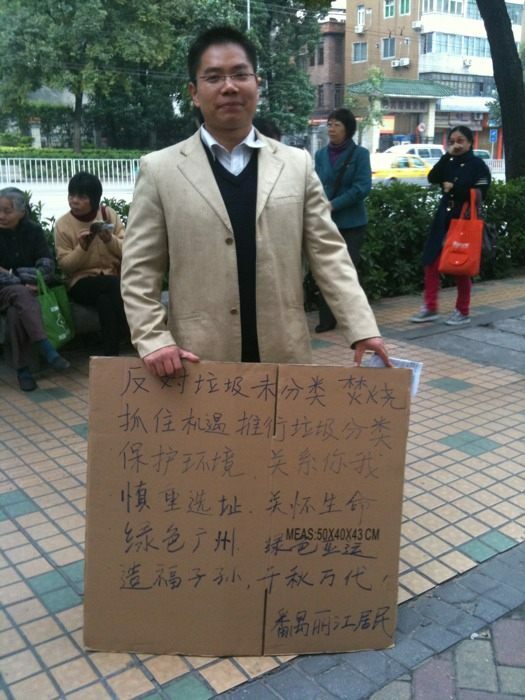 This urban management petition event saw many more petitioners than usual. 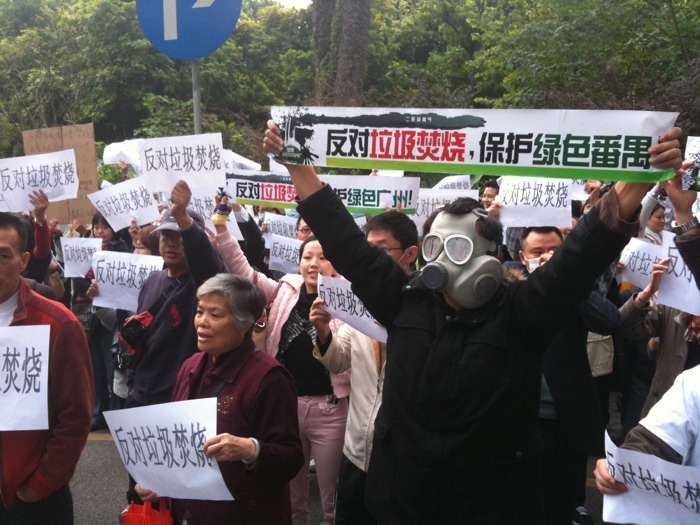 Ever since the the city management committee was set up with the department of environmental protection under it, the proposed Panyu garbage incineration plant project is the biggest problem so far. On the day when the city management committee came into being, November 23 was the day when the bureau chief assumes his job along with the department of environment protection in attendance. 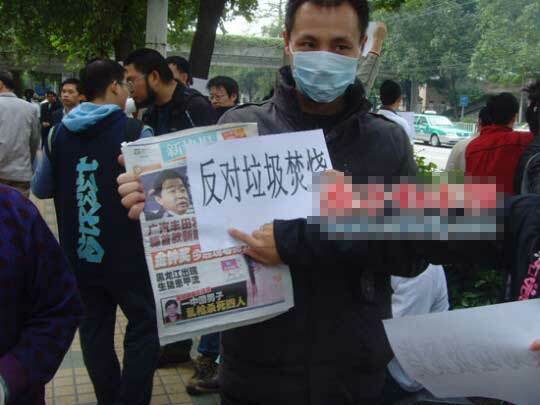 The director Li Tinggui said that that day will be used to gather public opinion about the garbage disposal plans in Guangzhou as well as the plan to build a garbage-incinerating electricity-generating plant in Panyu. According to information, the originally planned urban management committee reception at People's Park today will be postponed one month to December 23. This will be the first large-scale reception of petitions by the urban management committee. At that time, the custom is to have the urban management committee top leader handle the petitioners in person.